If I had to make a list of ten things I miss most about living in Spain, mangos would be on it! Not just any mangos, but the ones grown by a man named Rufino who has a food forest in the south of Spain near Granada. His finca, Fruta y Sol, has the most diverse offerings of anwhere- mango, cherimoya, passionfruit, green coconuts, fresh dates, macadamias and so much more!! Southern Spain has microclimates that are so much more tropical than most people realize. Anyway, every time mango season came around in early Fall, we would buy huge cases- like 15 kilos big ( a bit over 30 pounds!!!). I don’t even know what to say about these mangos. They were the ripest, juiciest, most luscious pieces of fruit to have ever graced these lips. Mango is a funny fruit, it most definitely has it’s own distinctive flavor but a truly tree ripened mango will tease you with other flavors- hints of coconut, pineapple, passion fruit, even vanilla! We would basically mono-meal on mango for a while, and then I would freeze lots of it for the richest and simplest sorbet ever- simply frozen mango in the food processor. Best Ever by far! 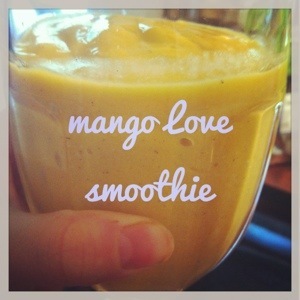 The other day, i came across some nice looking mango in my local supermarket that smelled nice and fragrant ( yes, i am that crazy lady at the grocery store sniffing the fruit, LOL) so I bought a few and made a smoothie that was just beautiful and simple and delicious. And it inspired this trip down mango nostalgia lane. Is there a fruit that holds a piece of your heart? 1 tsp ashwaganda powder for some adaptogenic goodness!